When the 7.8 magnitude earthquake struck Nepal in late April, I was out of the country. Asleep when the phone rang, I woke up to my daughter’s voice. Herself also receiving updates from Boston where she was enrolled in school, she briefed me on the earthquake’s aftermath. The historic Dharahara (a significant nine floor tower sited at the heart of Kathmandu) had collapsed during the earthquake and the entire city camped out in open fields due to the high risk of recurrence. Two long weeks later, when I returned home to Nepal, I could still feel frequent tremors. One night, I had to camp outside the house following an especially big aftershock. As I stared at the sky I thought to myself, this must be what it feels like to be displaced. Little did I know then that a visit, a few weeks later to Bhatedanda village, in South Lalitpur, would change my understanding of displacement. 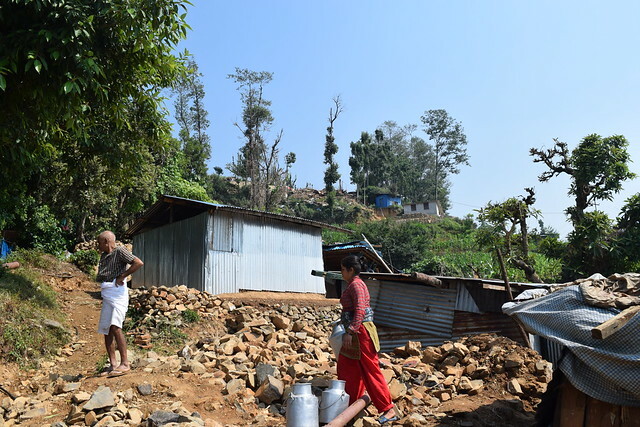 The April 25th earthquake and subsequent aftershocks destroyed almost all the houses and cattle sheds of 447 families in Bhatedanda. Walking through the inner alleys of the village, I was greeted with blank, almost hopeless stares. Peoples’ gaze rested on the rubble, topped with corrugated iron sheets that were once their homes. Most of the walls, built with stones and mud had collapsed from the quake. Their situation quickly put into perspective how foolish I was to believe that I’d been displaced when camping inside a safe tent in my garden. I spoke with a health official in charge of the area who predicted that when the monsoon arrives within a month, the elders and young children of the village would suffer from pneumonia and diarrhea, and some would likely loose their lives. I was shocked to hear this and cringed at the thought that many of the faces I was seeing would not remain. What chilled me the most, was that even those who dodged the epidemic, would inevitability be displaced from their land and livelihood. They say, when you’ve hit the bottom there’s nowhere to go but up. But going up in a situation where the staircase is turned into rubble is not an easy task. After my visit to Bhatedanda village I could not sleep. All night, I kept thinking about the importance of having a house. Early the next morning, I went to see Dilli Ghimire, the chairman of South Lalitpur Rural Electricity Cooperative. I told him that I was willing to donate all my savings to communities in South Lalitpur to enable them to build semi-permanent shelters for themselves that could last for 3 -4 years. This would keep families safe through the monsoon season and allow them to save some money to build permanent, earthquake resilient houses over time. Mr. Ghimire helped me mobilize the community of one ward, to build 20 houses made from corrugated iron. 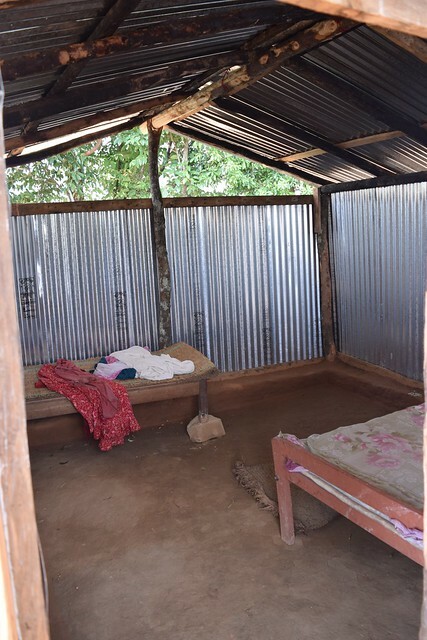 In no time Mr. Ghimire had identified one village ward, where 42 families had lost their homes, and a teacher from the community who could manage the funds and mobilize communities in the building process. Three weeks later, when I went back to the village, I was happy to see some smiles on the faces of the same people who looked hopeless during my first visit. Hiring a mason and carpenter from a nearby village, they had been able to build two houses each day. What surprised me was that they did not make all the houses the same size. They had distributed the building resources equitably (as per need of the family) rather than equally, allowing them to use money meant for the construction of 20 houses, to build 25. Alongside their homes, they also built small shelters for their cattle. My experience with this village has taught me that the government needs to act urgently to distribute relief funds for the building of shelters before the monsoon arrives. While distributing the funds, planners and policy makers also need to know that a “one size fits all” approach may not work. Community organizations can help to distribute the relief funds quickly and equitably as per the need of the families. Moreover, in mobilizing individual families to build their own shelters, these organizations will also be helping to rebuild community, hope and solidarity. Nepal’s local governments include 75 district development committees, 3,227 village development committees and 191 municipalities. For the past 13 years, since 2002, none of these units have held elections. Instead, these localities have been managed by executive officers sent in by the central government. In the wake of the earthquake, the absence of representatives elected by the people, means that bureaucrats have been entrusted with assisting the Central government in rescue and relief distribution operations. But, what my experience with the village in South Lalitpur has reinforced for me is that in the absence of elected local governments, involving community institutions is crucial, and the more appropriate choice. Better able to take into consideration factors such as geographical location and livelihood sources, they can take charge of the functioning of their villages. Even beyond aiding in the physical rebuilding process, engaging these institutions will give Nepalese hope for better days to come. To follow and contribute to efforts to build shelters for displaced Nepalese through a community based model, visit Shelter for Community Building. Post and Photos by Mohan Das Manandhar. Mohan is a visiting scholar at MIT.